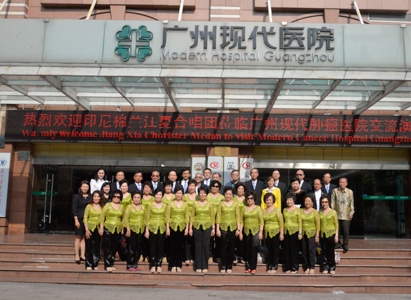 On November 4th, the Jiang Xia Chorister Medan, Indonesia was invited to Modern Cancer Hospital to give a concert to cancer patients. 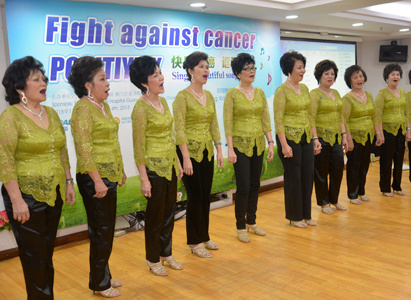 With the theme of “Fight against Cancer Positively, Sing a Beautiful Song to Life”, patients from Southeast Asian countries not only enjoyed the beautiful melody, but also experienced the charm of “Music Therapy”. It is known that Jiang Xia Chorister Medan is a performance group which is composed of local ethnic Chinese in Medan, Indonesia. Jiang Xia Chorister Medan is so popular that has been invited by the Indonesian Ministry of Culture, Foreign Ministry, Indonesian Embassy, Indonesian Consulate, Indonesian Chinese Chamber of Commerce and Indo-Chinese Federation for several times. The Jiang Xia Chorister Medan also conducted cultural communication performances on the commemorative activity of the 58th anniversary of the Asian-African Conference and other international activities. Moreover, the Jiang Xia Chorister Medan has won the silver award of the China International Chorus Festival and the first prize of the Chinese Composition Performance. With the Indonesian famous song Rayuan Pulau Kelapa, the concert started at about 4:00pm. The cheerful melody brings patients a acoustic feast, patients said that they seemed like traveling in Indonesia, enjoying the sea breeze and feeling peaceful and pleasant when listening the concert. Solo River and other famous songs were also sung at the concert. The audiences were obsessed with the Indonesian music. At the end of the concert, all members of the Jiang Xia Chorister Medan sang a famous Chinese song---Descendants of the Dragon. Huang Mingchuan, the president of Jiang Xia Chorister Medan said that the song “Descendants of the Dragon” is famous in Indonesia and it sings about the sense of national pride. With the theme of “Fight against Cancer Positively, Sing a Beautiful Song to Life”, the concert was highly praised and admired, and there was warm applause during the whole concert. A Vietnam patient said that she felt relaxed, happy and powerful when listening to the music, though she could not understand Indonesian. Indonesian patients were touched because they never thought they could listen to the Indonesian music in a strange country. Some even joined in the chorister to sing together. Yao Zhongping, expert of Modern Cancer Hospital Guangzhou, told us that music is an important cultural and recreational activity; different music causes different mood swing, and affects human body. Beautiful and cheerful music can not only help patients relax their mind, but also relieve their bad mood and improve their sleeping. Cancer patients should listen to music frequently, in that listening to music may help to stop the decline in immunity and activate the anticancer activity. Listening to music frequently can not only bring good to the treatment of cancer patients, but also improve patients’ living quality and prolong their survival time. At present, music therapy has become an important assistant treatment approach, and was widely used in cancer treatment. 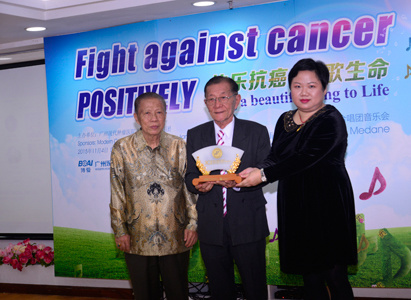 “Fight against Cancer Positively” is the idea that Modern Cancer Hospital Guangzhou always follows and persists, actually music therapy is the reflection of this idea. 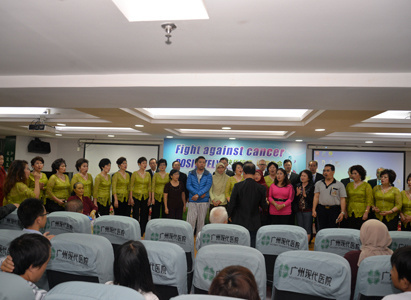 Except for this concert, Modern Cancer Hospital Guangzhou often invites professional chorus and dancing group for patients and the staff to relax their mind. Patients in Modern Cancer Hospital Guangzhou are suggested to listen to music frequently, so as to make sure patients take treatments with a good mood. Founded ten years ago, with its advanced minimally invasive technologies, such as interventional therapy, cryotherapy, natural therapy, etc, Modern Cancer Hospital Guangzhou has treated about 20 thousands cancer patients of different countries and made numerous anticancer miracles.